On an intriguing weekend of games, Division 1 Champions Mohill lost further valuable ground on the top two while Allen Gaels suffered their first loss in Division Two. With the top of the table clash between Glencar/Manorhamilton & Sean O’Heslin’s falling victim to flash flooding on Saturday, there was ground for Mohill to make up but Melvin Gaels held them to a high scoring draw in Kinlough on Saturday, 0-17 to 1-14. Mohill’s goal came from Ronan Kennedy with Keith Beirne scoring four points but it now leaves them three points behind O’Heslin’s and four behind Glencar/Manor with a game extra played. 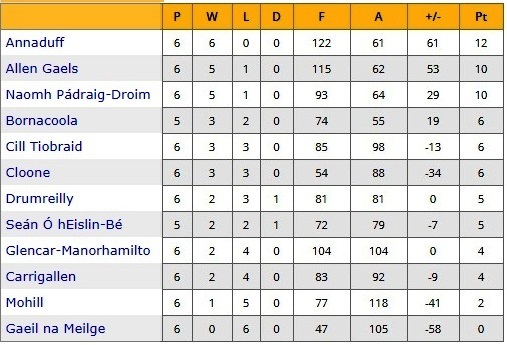 The big move in Division 1 was Gortletteragh who scored an impressive 2-13 to 0-15 win over Aughawillan to move into third place in the table, just a point behind Ballinamore who they have yet to play. The defeat, however, leaves Aughawillan third from bottom and only separated from the relegation places by two points on scoring difference against Ballinaglera who drew 1-8 apiece with their neighbours Drumkeerin. Drumkeerin’s point was enough to lift them out of the relegation places while a severely injury hit Aughnasheelin must be getting worried after they suffered a 3-15 to 1-10 loss to St. Mary’s Kiltoghert after trailing by just two points at halftime. The victory eases the pressure on the Carrick men who are now on six points, level with Fenagh St. Caillin’s who fought out a low-scoring 0-8 apiece draw with Leitrim Gaels. In Division 2, an impressive Annaduff are now solely top of the table thanks to a 1-26 to 0-6 destruction of Cloone while Allen Gaels suffered their first loss of the campaign to Bornacoola, losing 0-13 to 0-6. The Drumshanbo men missed a few great chances while the Bors showed the killer instinct to hit three injury time points to secure a win that moves them clear of a crowded relegation zone. St. Patrick’s Dromahair moved into third place in the table, separated only by scoring difference from Allen Gaels, when they secured a had fought 1-8 to 0-13 victory over Carrigallen, who are now only one place above the drop zone. 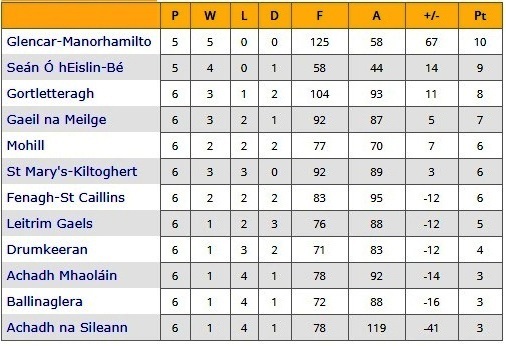 First teams continue to struggle against second teams in the Division with Ballinamore Sean O’Heslin’s drawing with their Drumreilly neighbours, 3-9 apiece, while Kiltubrid had to work hard for their 2-13 to 0-17 win over a Mohill team who beat them in the championship last year. The final game saw a north Leitrim derby as Glencar/ Manorhamilton defeated Melvin Gaels 5-13 to 0-11.